Turkmen authorities have never acknowledged any human rights concerns in their country and rarely respond to international criticism. An international human rights watchdog on Tuesday accused the European Union of ignoring rights abuses in energy-rich Turkmenistan in the hopes of securing future natural gas supplies. British-based Global Witness said the EU is misguided in pinning its hopes on Turkmenistan as a potential alternative gas supplier to Russia, which currently provides Europe with about one-fourth of its gas needs. They published the report to coincide with the opening of an international energy conference in the Turkmen capital, Ashgabat, which dozens of Western energy investors are attending. Rights groups have said violations are thought to be common in the authoritarian former Soviet republic, but confirming reports is nearly impossible due to tight controls over information. Reporters Without Borders in their annual ranking of press freedom worldwide released in October put Turkmenistan in the bottom three of the 175 countries evaluated. The group, also known by its French acronym RSF, compiles data on attacks, arrests, laws and overt or covert censorship in determining its list. 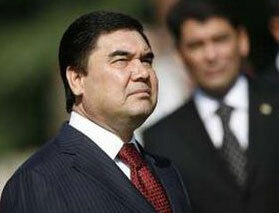 Turkmen President Gurbanguli Berdymukhamedov has made tentative commitments to introduce political reforms as part of efforts to open up to the West since he came to power after the death of longtime autocratic leader Saparmurat Niyazov in December 2006. The European Parliament in April approved an interim EU trade agreement with Turkmenistan — a move widely condemned by rights groups. «There is a risk that the Turkmen regime is learning to play to Europe's need for 'progress' on human rights by making small cosmetic reforms that could be reversed in the future,» the Global Witness report said. Western nations' plans to tap into Central Asia's vast gas supplies hinge on the success of Nabucco, a pipeline project backed by the U.S. and the EU but whose commercial viability is threatened by rival routes proposed by Russia. Many Western experts doubt that Turkmenistan will be able to ensure sufficient gas production to meet European demands and satisfy existing contractual arrangements with Russia, China and Iran. «Historically, Turkmenistan never meets its projected production figures due to the chaos that reigns in the country's oil and gas sector,» Global Witness said. China secured a 30-year deal to buy up to 1.4 trillion cubic feet (40 billion cubic meters)of natural gas from Turkmenistan annually starting in 2010. Iran is slated to import around 700 billion cubic feet (20 billion cubic meters) of gas from next year. Deliveries to Russia have been suspended since April amid a dispute over a gas pipeline blast that Turkmenistan blames on Russian gas monopoly Gazprom, which has a contract to buy 1.7 trillion cubic feet (50 billion cubic meters) of Turkmen gas annually. It also expressed concern over lack of transparency in the bidding process for international companies seeking to invest in energy projects in Turkmenistan.